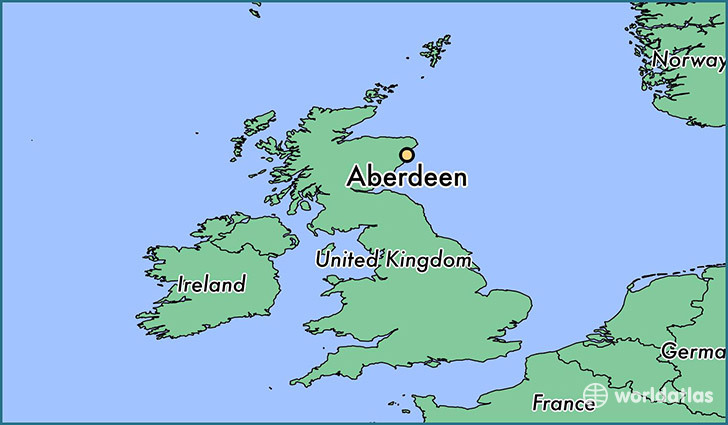 The first reasonable question expectedly is: “Where the city of Aberdeen is?” I’ll try to properly explain it. Do you remember when I went By train to the end of the world? Well, Aberdeen is located exactly on the opposite edge of the planet. I almost reached the South Pole, but for finding Aberdeen, you should cross whole Africa back, then whole Europe, also go through La Manche channel, jump on the Great Britain island, then go straight North, crossing the whole island and when you are about to fall into North Sea, your journey is completed and you are right in Aberdeen, Scotland. Does it sound freezing? Ohhhh, it really does. When I flew in March those 45 minutes from London to Aberdeen, I did not expect such a huge weather difference. I left London on 17 degrees C (63 F) but arrived in Aberdeen on 1 C above zero (34 F). In addition, it was windy (located right on North Sea shore), at the same latitude as Norway. The city is actually full of Norwegians, working at the petrol platforms all around Aberdeen, somewhere deep in North Sea. I guess the petrol platform workers enjoy Aberdeen pretty much, as the weather is exactly the same, they are used to in Scandinavia. If you have never heard about Scottish summer before, just check the notes in the gallery below. It says enough and no need of explanation. I am sure you are going to laugh, but when on site in Scotland, there is no much room for laughter, because your lips would be quickly frozen. I guess the next reasonable question is, why a sun lover like me, was heading almost to the North Pole, dealing with poor weather treatment? I promise, it was for only two days, just visiting my older son, who was a student in Robert Gordon University, Aberdeen. By the way the education is really great there. Two extremely famous universities, founded two centuries ago. Surprisingly the highest concentration of life scientists in Europe is to be found in the Aberdeen area. That Northern city also holds the TOP positions in UK for the lowest unemployment and for business competitiveness. Aberdeen has been pointed, extremely surprisingly to me, to be the happiest place in Scotland and the second happiest place (after Oxford) in UK. I absolutely have no explanation how it got on the top. It looks to me kind of depressive with awful weather, a bit oppressive atmosphere and grey environment. 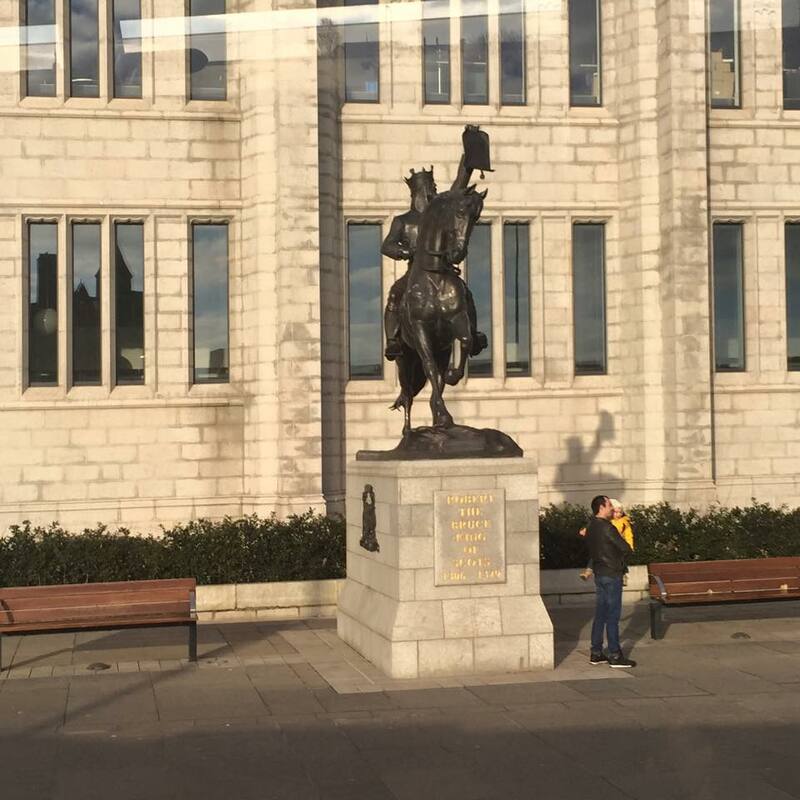 Aberdeen is literally grey coloured and understandably called the “Granite city”. Almost all the city is built by massive granite stones. Arriving there, a comparison popped up in my mind and I saw the city as a grumpy, unfriendly and moody old man. I guess the general impression is somehow compensated by the enormous number of young people in the city. Because of the two very famous universities, Aberdeen is overcrowded by students, coming from all over the world. They succeed to warm up this rough environment, which is subordinated to the oil industry. But the grey, cold mood remains in this granite city and if you expect to find greenery, walking the streets, just forget about it. 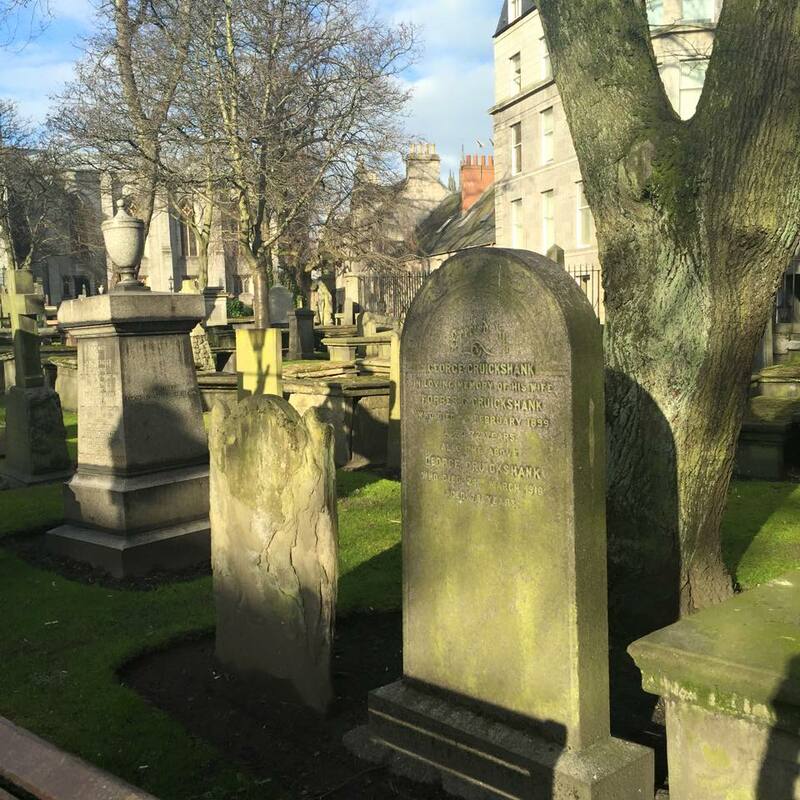 The greenest spot I found, rushing the down town was…a cemetery. I should admit though, I truly liked it. It’s obviously a very old cemetery, with well shaped old-fashioned granite gravestones and crosses. Even the benches around were from granite. The feeling was like I am suddenly teleported to another reality, distant century, expecting some iron dressed and armed knights on heavy horses to appear right behind the corner. The cemetery looks stable and unbreakable. I checked on some of the gravestones, they were placed 350 years ago. Covered by green moss, those stones are remote story tellers. 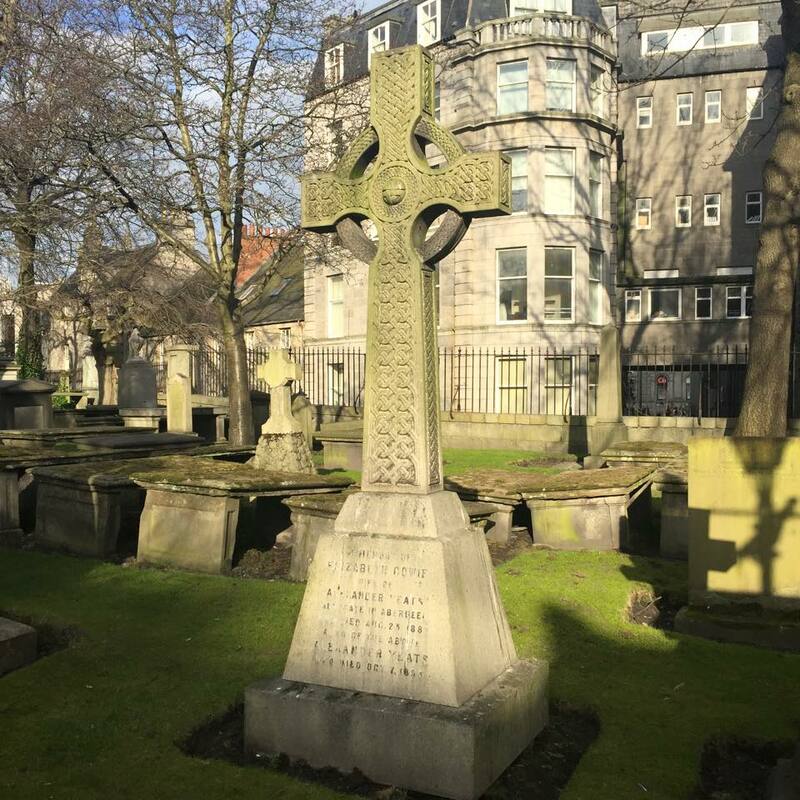 And here, right at the cemetery, in the heart of Aberdeen, everything is quite green. Lots of green grass, bushes and some trees around, which is pretty unusual for the Granite city. So, if the friendliest and the greenest spot in the city is the cemetery, we should stay on the same wave. What suits the cemetery most? A prison, of course. As you would notice, most of the features of Aberdeen are unexpected, unusual and surprising. Just check one more time the statistics, I already mentioned above. It proves, this city has what to challenge you by and keeps your mind sharp and alerted. Obviously stuff beneath the surface looks different. Thrown at the Northern end of the world, this cold, windy and rough place still keeps mysteries and secrets. Seems like they won’t be revealed to everyone, but only to those who have eyes to see it. I love enigmas. 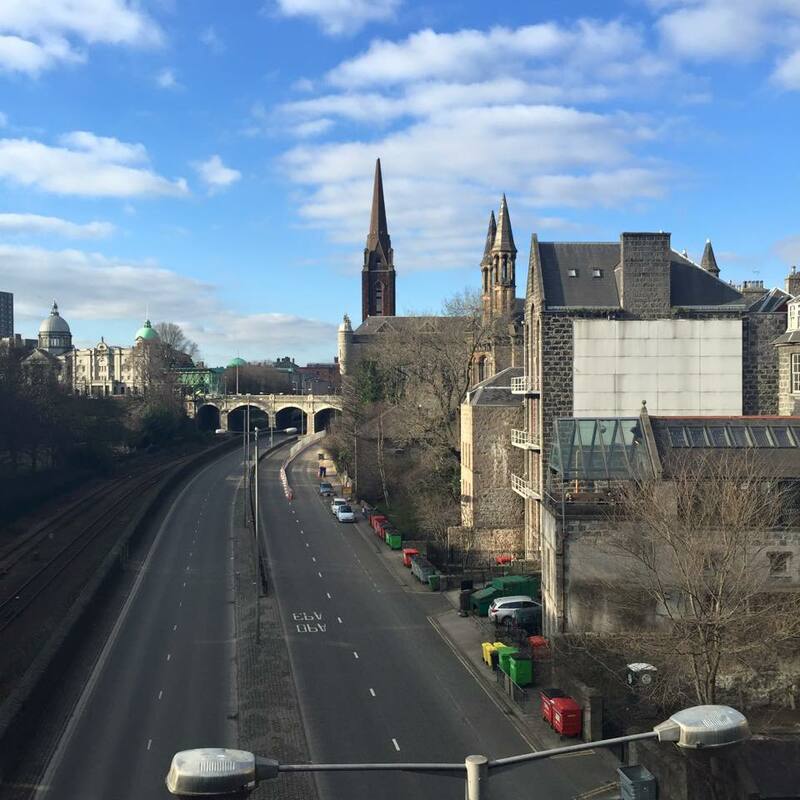 The short stay in Aberdeen definitely provoked me to discover as much as I can. I was wandering, putting my nose in everywhere I thought it’s worth it. I was curios to observe the local people, with their habits, culture and manners. To attend any event I could find, to taste any disgusting meal (I find the local food not tasty). To knock every locked door, which may hide any history or thrilling stories behind. To take as many photos as I can. To get a ride by public transport, taxi and bike. To visit the Mall, drink cappuccino in Giraffe cafe, also getting lost as usual (my favourite activity), while walking the streets. This way I finally got into jail. I have never been in a prison before. When I was brought to Aberdeen’s prison, I found it grim, gloomy and depressing. Built by the same granite stones as the whole city, that prison looks like lots of ghosts still live inside. The fear grabs you at the doorstep yet. I have expected to be chained and sentenced to death. I was really worried, but at the same time curious, because it was my first prison experience ever. I am sure you are also curious and probably impatient to find what’s the reason for ending up in a prison. Well, I was told there are only two reasons someone could be caught and chained in there. You should be a thief/debtor. The second option is to be a witch. I know myself well, I am definitely not a thief, neither a debtor. The only option left – I might be a real witch to hit the way toward Aberdeen’s jail. Thank God, the Inquisition times were over and I won’t be burnt at the stake. But as a witch, a miserable destiny was meant to me. Lifetime spent between granite cell walls, chained, threatened to die likely by frost, if no earlier by hunger…What a cruel way to die, just being gifted and over skilled! No doubt, this prison suits me and I found the path toward not by coincidence. What I skipped to tell you – it was the best guarded prison, really scary one, providing awful conditions but…in the 17th century. At the moment it’s just a museum, called The Tollbooth, preserved in its original structure, complemented by some human figures, who give a complete picture of the life and punishment four centuries ago. The great story here is the escape of Alexander Keith, 374 years ago on July 23th,1638, when he has organised his getaway in a chest. Imprisoned in The Tolbooth for a debt, Alexander Keith was relative of the Earls Marischal of Scotland. Alexander’s escape is one of the most daring and reminds the popular Count of Monte Cristo story, immortalised by Alexandre Dumas. Alexander Keith’s 400 year old escape turned to a legend and has been reenacted several times during Aberdeen’s Tartan Day in the end of July. What I also learned, in the mid of the 18th century, The Tollbooth has been one of the many places associated with the darkest episode of Aberdeen’s history. A number of Aberdeen’s merchants and magistrates arranged the kidnapping of hundreds of children from the town and the countryside. These children were then stored in various places, including The Tollbooth, before being transported to the Americas and sold as indentured servants. The Tollbooth stopped working as a prison in the 19th century.